Pumpkin Chutney is a great accompaniment for all sorts of dishes. I like it on a ploughman’s lunch with good cheddar cheese and homemade bread. Peel pumpkin, discard seeds and the pith. SLice and cut in pieces. Pour boiling water over tomatoes skin and slice. Peel and slice onions and garlic. Put all solid ingredients including spices and sugar in the pan. Add vinegar. Boil gently and cook until the mixture is jammy. It will take about 50 minutes, stir frequently and skim. I am always amazed at the sight of wild crab apples hanging from autumnal branches in the woods where you least expect to see apples. Sometimes there is the sad site of a tree that has lost its load and there is a carpet of apples at its feet. Slowing fermenting in the late indian summer or being nibbled by muntjac deer. Too sour to eat raw they make a lovely jelly and combined with a few sloes or rosehips to add a red glow they form a work of art with the sun glinting through them on the kitchen shelf. This is a delicious jelly to eat with lamb but can be a useful accompaniment to many dishes. The addition of sloes or rosehips will add a pleasant tinge of red to the jelly. You could also try cranberries. You could leave out the rosemary for a plainer version. You can also add a pint of cider vinegar which gives the jelly a bit of a kick. You will need to measure the resulting juices but about 3Ibs of sugar for 3 pints of liquid but this will depend on how much you obtain from your apples. 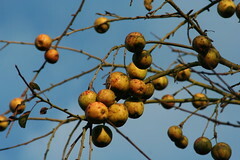 Collect a bag of wild crab apples avoiding heavily bruised ones. About 3 lb. Wash the apples and chop into quarters. Put them in a preserving pan and cover with water. Then cook until they all go soft and mash them up a bit with a wooden spoon. Cook up the rosehips or sloes in a separate pan with water and cook until they go mushy and then add the mush to the main mix. Pour all the mix into a jelly bag and leave overnight for the juice to drip out. You are left with a clear juice. Simmer the liquid in a pan (about 20 minutes) with the sprigs of resemary to create an infusion then strain back into the preserving pan. Measure the liquid and then add 1 lbs of sugar for every pint of liquid. Boil rapidly until a set is obtained. The sound of boiling will change and it goes frothy on top. Use a saucer from the freezer to test the set by putting a dropof the liquid back in the freezer for a minute or two to cool. Test to see if it has set. Skim the liquid and then pour into heated jars. As they cool put a fresh sprig of rosemary into each jar for decoration. I love to use redcurrant jelly as an accompaniment to lamb and pheasant and this is the time of the year to make it. Picking the redcurrants is quite a job because they hide away under the leaves. You can strip them off easily once you find them, stalks and all. You need quite a lot and we managed about 4 bowls of currants and ended up with – well, you will have to see. Redcurrants this recipe is for 4 large bowls about 4 lb. Wash the redcurrants and put them in a large preserving pan with about a 1 pint of water. Heat gently to release the juice and stir frequently. Cool. Pour everything into a jelly bag and hang it up over a bowl overnight. In them morning, make yourself a strong cup of tea and inspect the bowl. It doesn’t look much but you should have a lovely deep red juice. Measure it. I got 1 1/4 pints. I added 1 1/4 lbs of sugar. In other words – the same amount of sugar in lbs weight. Put back into the preserving pan and stir with the sugar and boil. I tested the set by keeping some saucers in the freezer. I then put a drop on the saucer and put back in the freezer to cool for a moment or tro. Run your finger through and it should be jelly like. If not – keep boiling. Finally, cool and add to warmed jars. How much did I make? From 4 large bowls of redcurrants we made 5 small jars of jelly. It seems a lot of effort for a small amount but it goes a long way and is delicious. 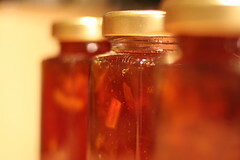 Home made seville orange marmalade is Ymzala’s staple conserve. Usually served on toast with coffee before setting out on the latest walk. I always serve this with coffee instead of biscuits. You need a bit of substance when heading out into the wild British countryside.This recipe is from my mother who used to make all our marmalade when I was growing up. Its not Women’s Institute standard so it won’t win you prizes but its easy-ish to make and very tasty. Ingredients – 2 lb seville oranges, a lemon or two, 4 lb sugar. 2 pints of water. I use a pressure cooker to cook the fruit and a preserving pan to finish the liquid off. This makes 7lbs of marmalade. Optional – a grapefruit. I like billingtons sugar as it doesn’t seem to create so much froth. Start by washing the oranges and pushing a skewer through the fruit several times. Put the fruit in the pressure cooker and steam for 15 minutes at pressure. Then when its cool, cut the fruit open scoop the pith out into a bowl. Its should fall out the fruit and leave the skin intact but soft. Put the pith into a sieve and rub the pith through with a wooden spoon. Pour the juice into a large preserving pan. Cut the peel into chunky strips and put into the pan. Add the sugar and stir in well. Bring slowly to the boil, stirring all the time. Then boil vigorously until it reaches setting point. I always dither over this. I use saucers that I put into the freezer and then test the liquid by pouring a few drops onto the saucer and put back into the freezer for a few moments. It should cool quickly and you can see if its setting. The boiling also changes its pattern and becomes more lumpy. Whatever happens keep an eagle eye on the pan and don’t let it boil over. When the cooking is finished put some clean jars into the oven at a low temp. This will stop them cracking when you pour the marmalade into them. But let the liquid cool down a bit before ladling it into the jars. Put the lids on and keep them in a cool place.